Salmon and... Bunny Triplets Bento, a photo by sherimiya ♥ on Flickr. Our semi-weekly grilled salmon teriyaki over roasted diced garlic potatoes fits nicely in the magic round bento box ...and I can pass it along from MisterMan to TinySprite now. A single sprig of steamed broccoli, a tiny cup of corn off the cob, and a couple of carrots round out the vegetable section. Strawberries and grapes fill out the rest, and a trio of bunny-shaped Okinawan sweet potato slices adds a shot of vibrant violet. I like the deep sections of this box for my girl, because it's much easier for her to scoop out the food. Do you see the baby pumpkins? I'm trying to get into the fall mood over here, but the summery weather isn't helping. I'm feeling more in the ice cream mood lately... is it cooling down in your part of the world? Oh yes I've got plenty of chilly breezes for you in Southern Finland Sheri...I'm not sure if summer actually even came this year! So the colorful sun drenched post you make often provides me with a little protection from the oncoming winter melancholies! I wish I could have poster sized pictures of the gorgeous fruit you had this summer! Anyways, beautiful job as always! Chilly in Finland already? You'll have a festive holiday season, I think! 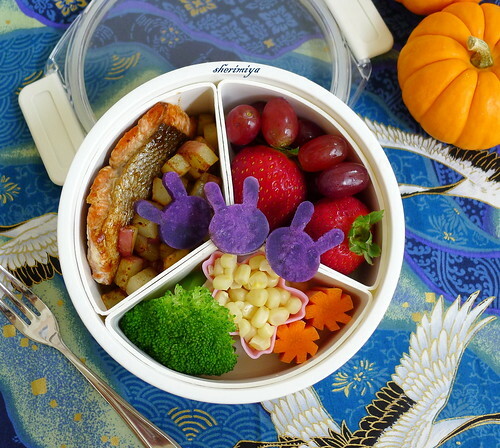 Loving the sweet autumnal brights in this glorious bento! your bentos are always so cheerful! yes, cold cold here in Alaska. Today I don't think it got above 25°. Tonight supposed to be down in the low teens! Too cold too soon. We usually don't have such cold temps until December or January. We should have snow by Halloween. Wow Alaska! I guess I shouldn't complain! I think a white fall and winter sounds delightful. Hello, Nice to see your blog, nice to meet you. Your Bento is Cool!